That's a catchy subject line for an email, isn't it? Can't blame you if you opened it like I did. I've recently received a number of emails coming through contact forms on my various sites, each with a subject along the lines of… “Noticed something about your WordPress Site”. I realized while I was on your website that you have a WordPress website. At first it seemed a bit sluggish and was a little slow to load. I also had this problem a while ago with one of my WordPress sites. Webhosts like Godaddy, Host Gator, Blue Host, etc often overcrowd their shared hosting plans which can be bad for your website, have you ever looked into this? If you have a moment, it’s always a good idea to follow the two steps in that guide to test your current host. Your hosting is one of the most important factors for a WordPress based website. Good luck with your website! The copy makes valid points about overcrowding, site speed and WordPress Administration panel loading speed. 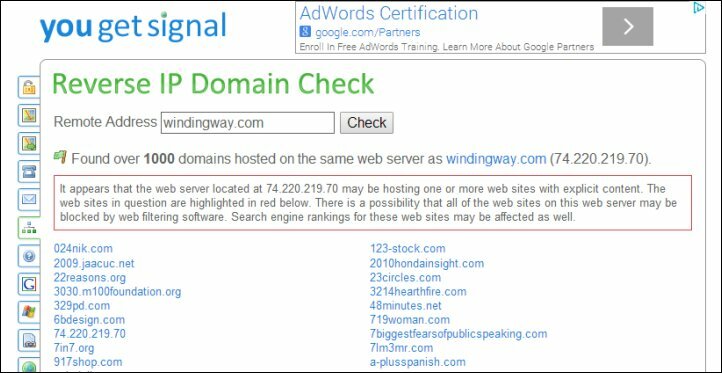 They found over 1000 domains hosted on the same web server / IP address as windingway.com. So, what was the ‘something' problem that they noticed about my WordPress site(s)? They didn't notice anything about my websites other than they are WordPress sites. Although I received similar emails pertaining to each of my domains, only ONE domain is hosted on BlueHost – the others are on my own dedicated server. It's easy enough to find out where a site is hosted by going to Whois.net. Not that they would bother… they just look for contact forms and paste in their spam messages with the hope that someone will buy the hosting they recommend through their affiliate link. If you DO get an email like that, just mark it as ‘spam'. We do NOT want to reward affiliates with commissions that they achieve through scamming and spamming. Sigh. So many people new to internet marketing think they have to scam or spam their way to success. They think the only way to earn a living online is to trick people into giving them money. Well – that never works. Not if you want a stable long term business. I have had plenty of the same and similar emails as all of my sites are wordpress sites. Another common one is that the images aren’t showing up and it is a shame because they really wanted to see our content and that music started playing when they went to my site. There is a new scam everyday.